Cherry Blossom Festival Japan – There’s a special time each year in Japan where people get together to do something that many wouldn’t think was very exciting – they view flowers that have recently bloomed. Specifically, citizens and tourists alike gather around various areas in Japan to gaze in admiration at the beauty and grace of such simple, delicate flowers. As with every tradition, there is a rich history and reasoning behind every cherry blossom festival throughout Japan. Cherry blossom festivals have been around since 710 in Japan. Originally, it was actually plum trees that were celebrated instead of cherry trees, and only the emperor and his court could enjoy the celebration. Soon, however, the festivals were attended by samurai, artisans, and eventually everyone who wanted to celebrate and enjoy time looking at beautiful flowers. Cherry blossom festivals in Japan were also originally only marked because they divided the year’s harvests and marked the beginning of rice-planting. Offerings were made to the kami thought to be inside each and every tree to ensure a good growth and harvest of the crops. Afterwards, the offerings were enjoyed with a bottle of sake, and many good times were had. It’s not hard to see that the origins of cherry blossom festivals in Japan were not all about the flowers themselves. Changing from plum to wisteria and finally to sakura (cherry blossoms), the actual celebration is about the time spent enjoying the day with other people. Grabbing a bit of food and a drink, setting up a blanket under a beautiful tree in full bloom, and enjoying the company of others has always been at the center of this celebration. Cherry blossoms are so important to Japanese culture and tradition that you can find an impression of a cherry blossom on the backside of every 100 yen coin! Although the name ‘hanami’ means flower viewing, the most predominant flower that’s viewed by the majority of people are cherry blossoms. It’s said that over time, older citizens would gather under plum trees and have a more mellow celebration while they watched those under cherry trees enjoy a more lively party. One thing’s for sure – you’ll find more crowded and noisy parties under sakura trees during cherry blossom kyotofestivals! Hanami is a time of rejoice and celebration, as well as a time to look back and reflect. Many say that the beauty seen in the flowers is a reflection of our own mortality. Just like the small time frame that such glorious flowers have to bloom, we all have fleeting lives that only last a short while. Yet, that shouldn’t stop us from admiring the beauty of the world around us and appreciating what we have while we’re still here to enjoy it. 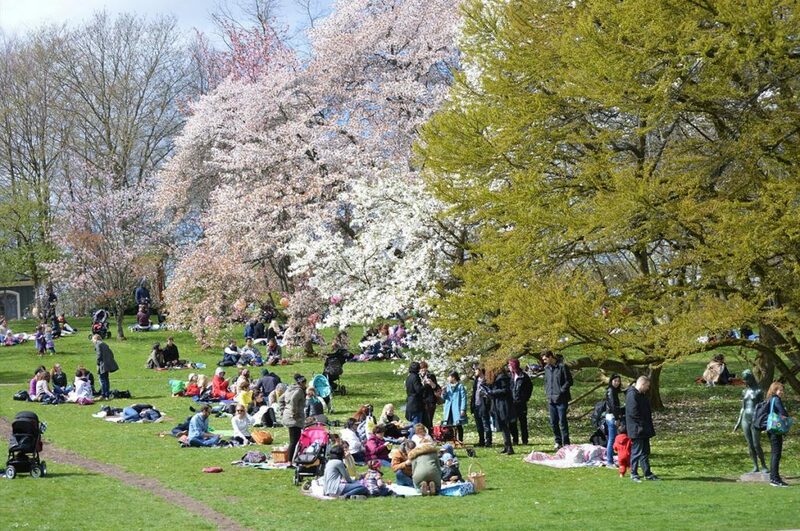 In today’s practice of hanami, people will flock to parks and open areas with cherry trees while the trees are in full bloom and enjoy feasts under the branches. 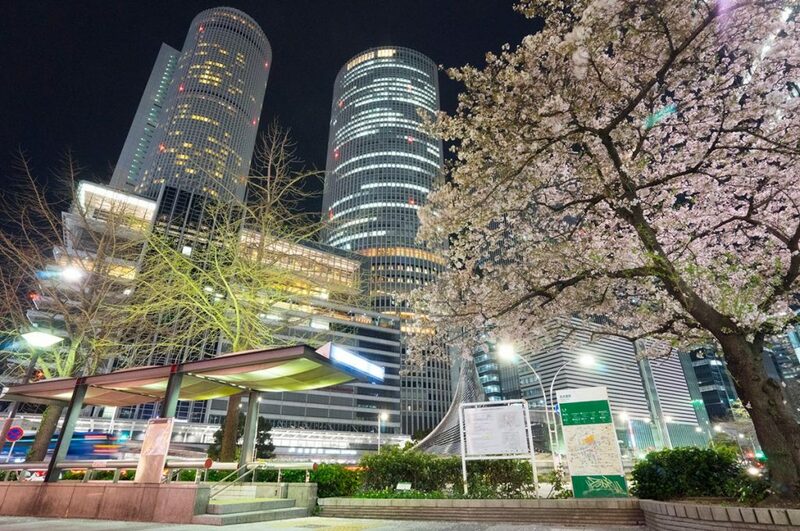 Food, drink, and fun are always plentiful during cherry blossom festivals, and since there isn’t enough time during the day for everyone to enjoy the sights, many festivals go well into the night and are called “yozakura”, or night sakura. These events can be just as enjoyable and fun as hanami, and some people actually prefer them over viewing the flowers during the day! Overall, the main thing to remember about cherry blossom festivals in Japan is to have fun! The window of opportunity to see the blossoms is between January and May, though the most blossoms happen in March and April. This is generally the perfect time for students, family, friends, and coworkers to go, as schools end in March and begin again in April in Japan, and many jobs will give time off to enjoy the celebrations. If you’re already excited about seeing these beautiful blossoms for yourself, then read on to find out when and where to go to see these gorgeous blooms! Cherry Blossom Festival Japan – When? 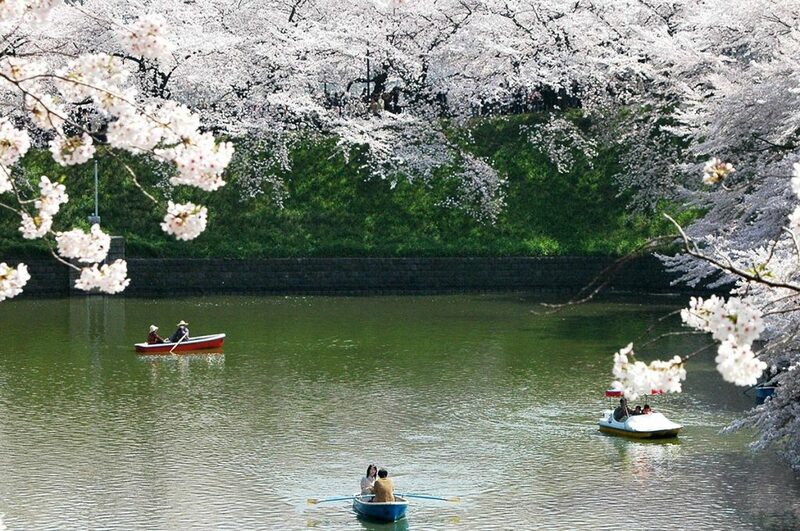 No one knows what tomorrow’s weather will bring, but everyone in Japan closely watches the forecasts and predictions for cherry blossom season. There is the ‘first bloom’ period, as well as the “average bloom” period. It’s important to note the distinction between these two periods, and one of them is when the first of the flowers will bloom (meaning that there could only be a handful of blossoms on any given tree), which the other is when most of the flowers should already be in bloom. 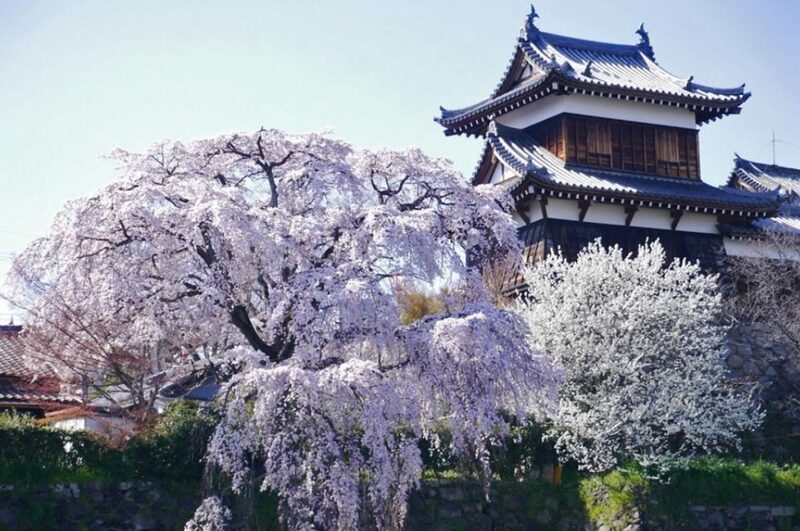 Since there is only a one to two week window of opportunity to see the flowers bloom, it’s important to stay up to date with Japan’s forecasting if you want to arrive at your destination at the perfect time to see the optimal amount of blossoms. Go too early and you’ll see a few blossoms and a ton of buds; go too late, and you might see a few blossoms and a sea of pink petals all over the ground. Did you know that there’s more than one standard type of cherry tree native to Japan? Even so, every tree blooms the same way. It’s no simple process, but the results are absolutely spectacular. Cherry trees, like most other flowering trees, receive signals about the state of their environment through temperatures, sun, wind, and water. Once a tree has determined that outside conditions are ideal, it spurs its reproductive functions into action. Flowers can spread pollen to other flowers and create fruits with seeds. These seeds are dropped or eaten by animals and passed through them to different locations. No matter where the seeds end up, there’s a good chance that they will grow into a new tree. As such, cherry trees in Japan may or may not produce cherries. Some of the trees have been cultivated for ornamental use, and so they do not bear fruit. Whether or not cherries will appear on the trees makes little difference to the beauty of the flowers, as each tree shows off its prettiest petals regardless of fruit creation. 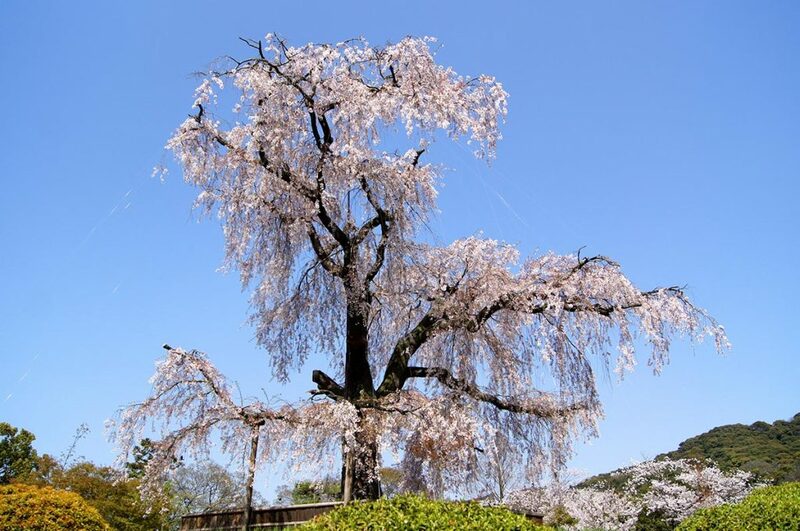 Below, we’ll give you the approximate dates of blooming for the most common areas in Japan to view cherry blossoms at. These dates are, of course, estimates, and may or may not change each year due to weather conditions. 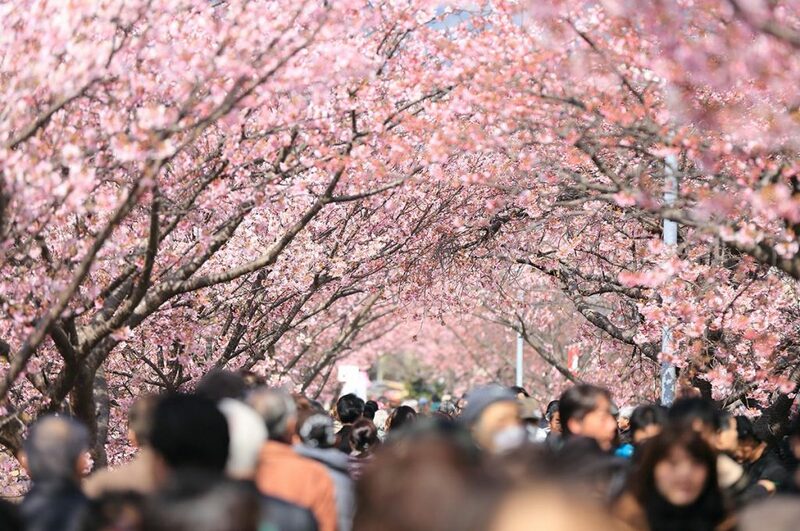 It’s up to participants to stay up to date with the latest information if they want to have the best experience at cherry blossom festivals in Japan. 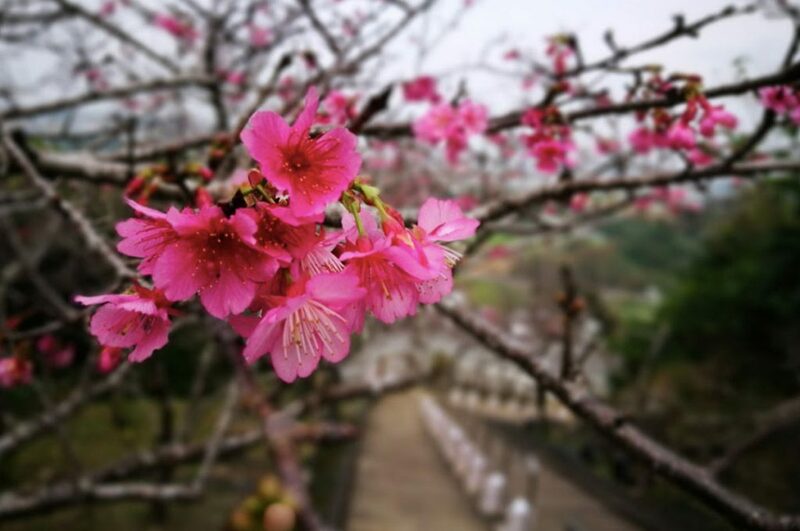 In Okinawa, the estimated average first bloom is said to start in late January. The estimated average full bloom is generally in the second week of February. 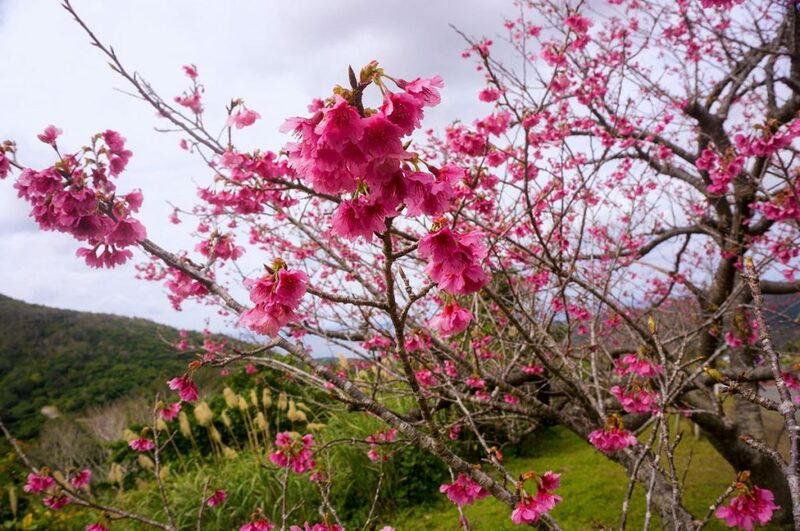 In Kagoshima, the estimated average first bloom is said to start in mid March. The estimated average full bloom is generally around the end of March and beginning of April. 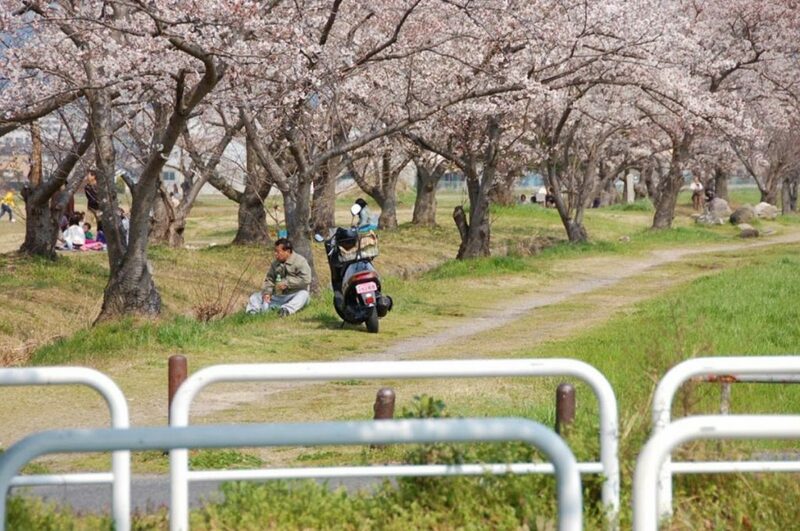 In Fukuoka, the estimated average first bloom is said to start after mid March. The estimated average full bloom is generally the last few days of March and first few days of April. 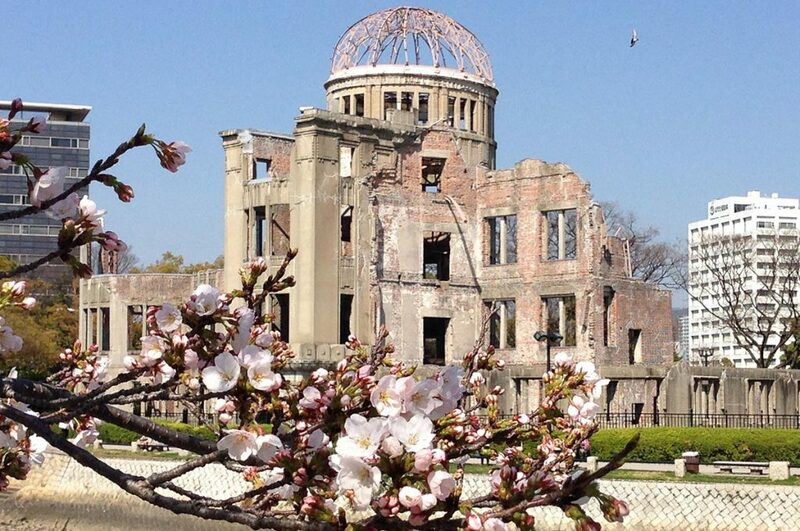 In Hiroshima, the estimated average first bloom is said to start towards the end of March. The estimated average full bloom is generally after the last few days of March. 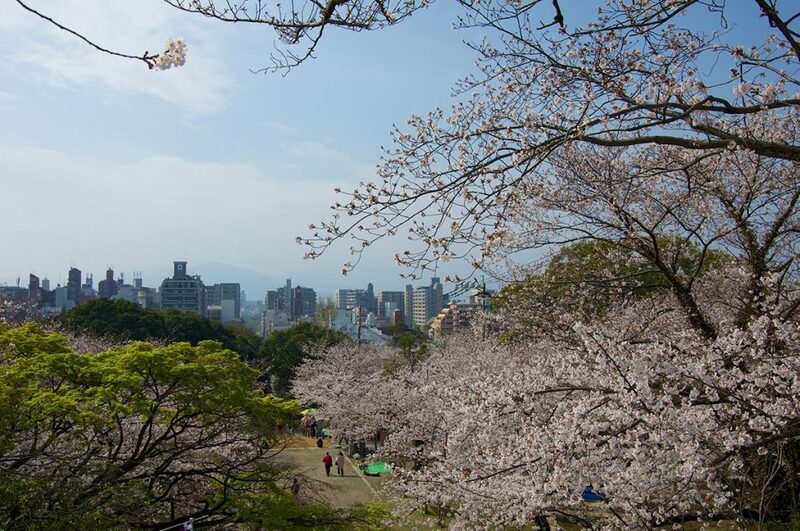 In Osaka, the estimated average first bloom is said to start just after mid March. The estimated average full bloom is generally in the last days of March and first few days of April. 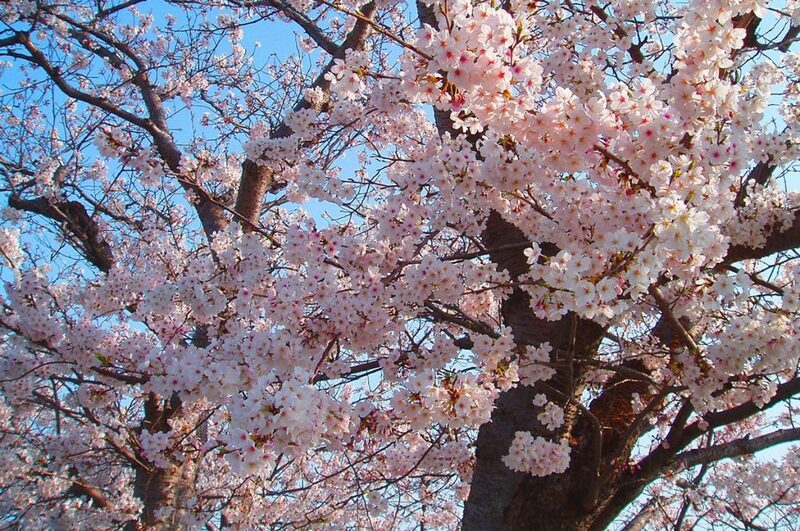 In Nagoya, the estimated average first bloom is said to start around mid March. The estimated average full bloom is generally at the very end of March to the first week of April. 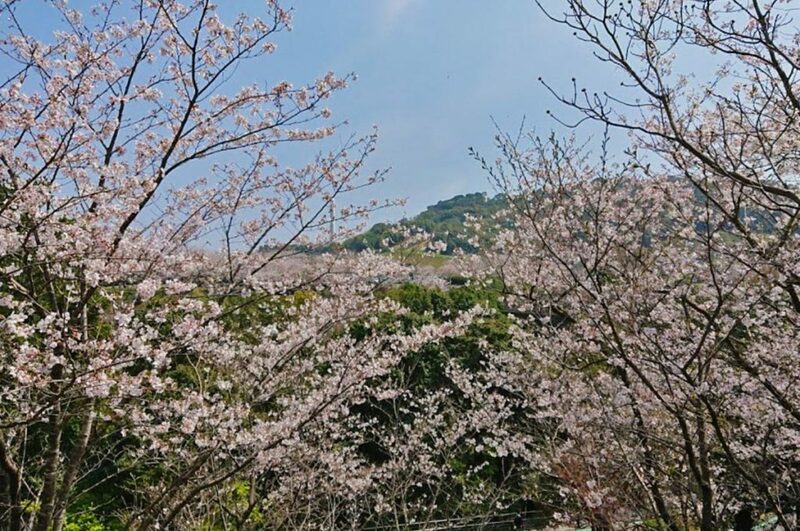 In Kamakura, the estimated average first bloom is said to start anywhere from February to April. This makes Kamakura a great place to head if you won’t be in Japan for the rest of the spring season but still want to see gorgeous sakura trees. 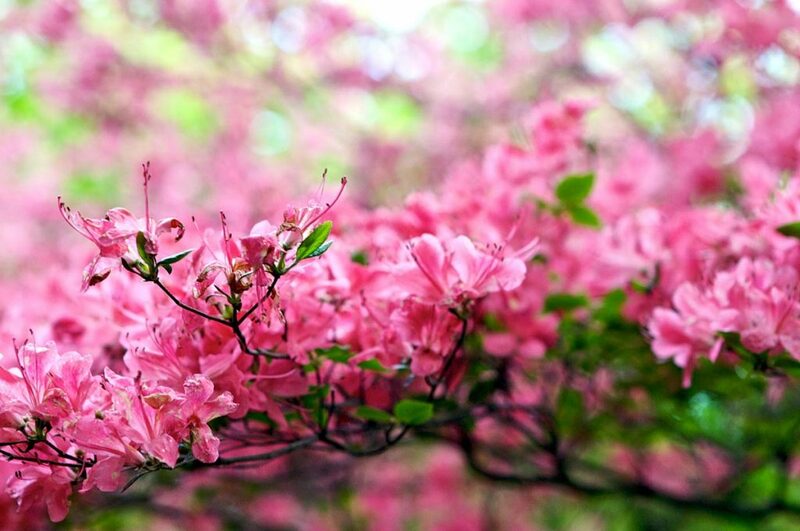 The estimated average full bloom is generally at the end of March to the beginning of April. 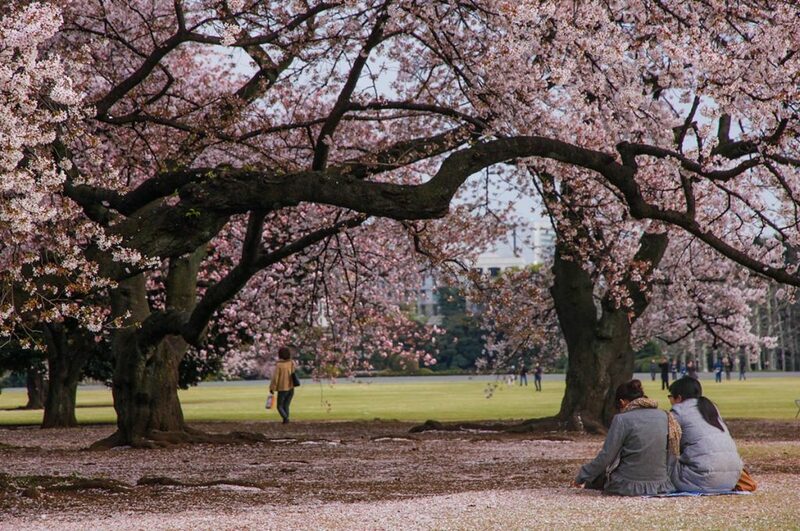 In Tokyo, the estimated average first bloom is said to start in the middle of March. The estimated average full bloom is generally from the last third of March to the first day or so of April. 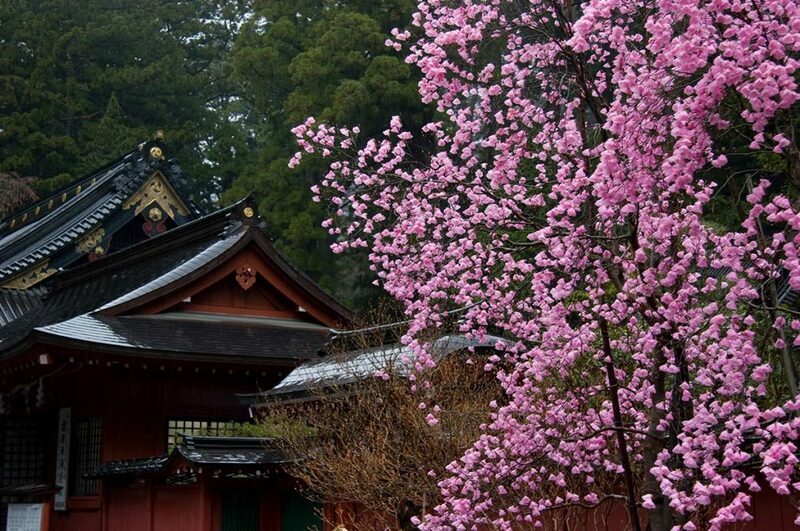 In Nikko, the estimated average first bloom is said to start around mid April. The estimated average full bloom is generally from late April to early May. 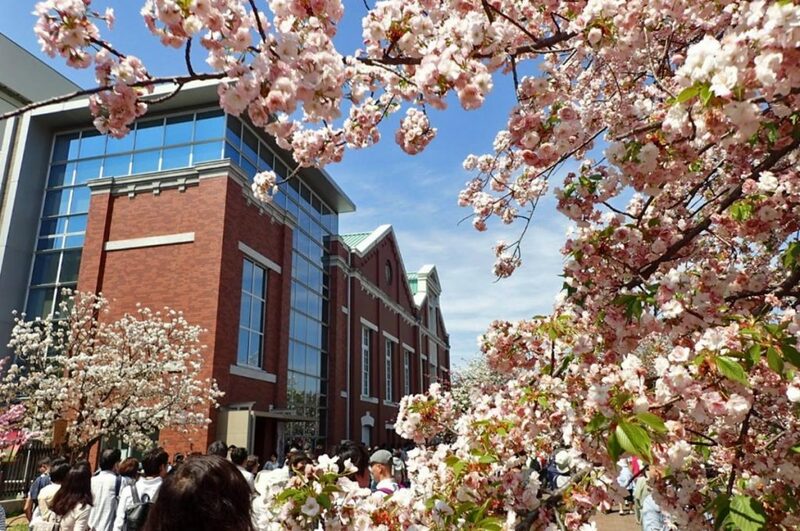 In Sapporo, the estimated average first bloom is said to start in late April. The estimated average full bloom is generally the last few days of April and first few days of May. Cherry Blossom Festival Japan – Where? With so many cherry trees in Japan that are perfect for viewing, it seems like a daunting task to choose where you’ll go to enjoy the festivities. 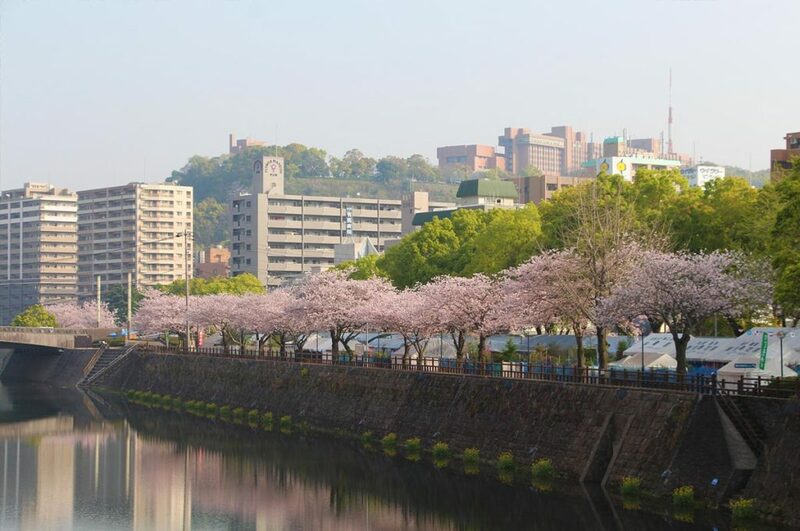 To help you out, we’ve put together a few places around Japan that are known for having the best spots for hanami parties! Take a look and pick whichever one you think would suit you best! If you’re missing the tall, beautiful palm trees native to warmer areas of the world, then head over to Yogi park! 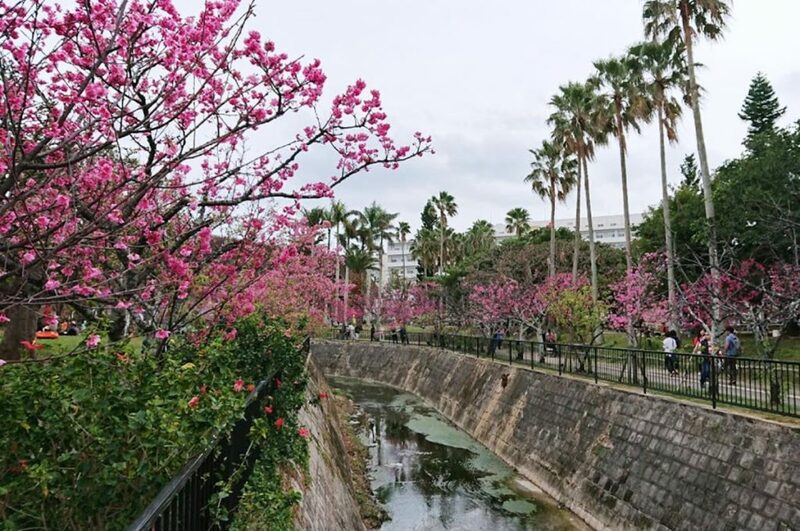 You can witness over 200 cherry trees blooming alongside tall, slender palm trees! Truly a sight to behold! Yogi park is especially good for those who have small children, as there are many attractions for them to choose from. Whether its the interesting seesaws, jungle gyms, or steam trains, everyone will have fun at this cozy park! What more can you expect from a park made within the remains of a castle? When the sun goes down, the area is lit well enough that spectators can still enjoy the beauty and grace of over 500 cherry trees! Being built in such a high location means that you also get a great view of all the surrounding areas in addition to the gorgeous blooms. Bring a blanket, some good food, and satisfying drinks and enjoy a hanami event you likely won’t forget! Adding a Chinese twist to the traditional castle styles of Japan, this lovely park is open to any and all who want to enjoy cherry blossom festivals! 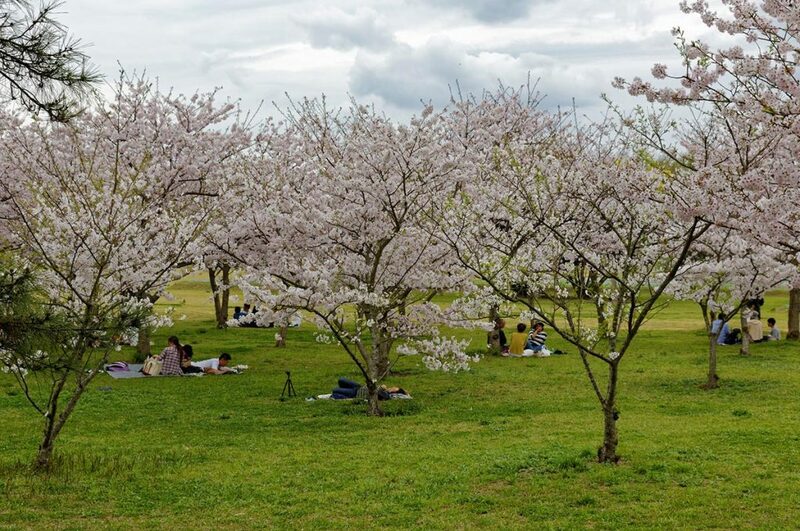 Perfect for those who prefer to stay away from large crowds, this park hosts a handful of cherry trees, which are more than enough for anyone who might want a quiet night out to celebrate. Grab a friend or two and embrace the quiet beauty this historic park has to offer. 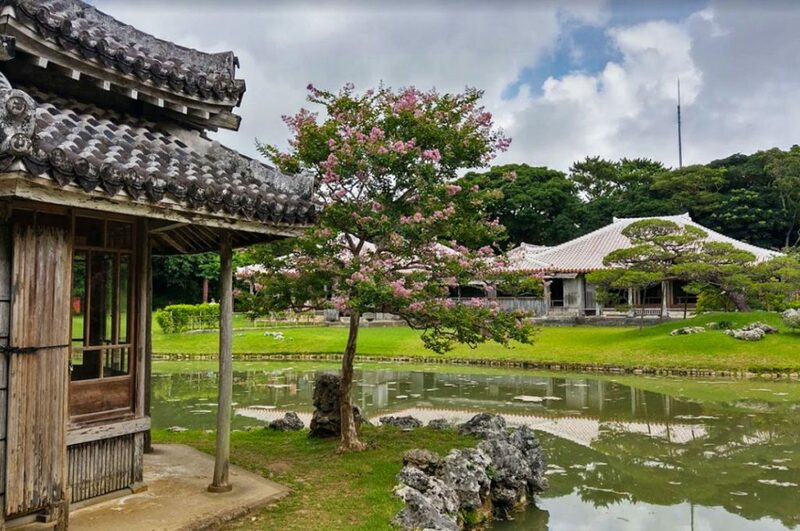 Check out our Naha Okinawa article, if you want to discover more places to visit! There’s a surprise around every corner at this amazing park located in lovely Kagoshima. 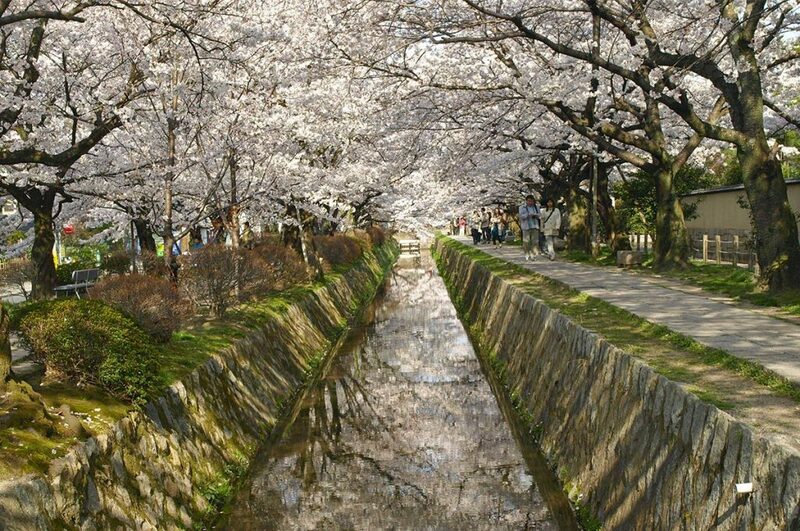 Free to anyone wishing to view some of Japan’s best cherry blossoms, this park is optimal for families and average viewers alike. There are playgrounds for the children, food stalls for all hungry park goers, and eye-catching flora and fauna that everyone can enjoy. Looking for something a little more fun and exciting for your day out viewing flowers? Then head on over to the zoo! Boasting an impressive amount of animals, both exotic and domestic, this fun area of Kagoshima is sure to delight anyone who’s looking to get more out of their time in Japan. Don’t forget to pick up a little something in the gift shop to keep the memory of your trip alive and well! Looking for a little history lesson while you’re in Japan enjoying the sights of the cherry blossom festivals? 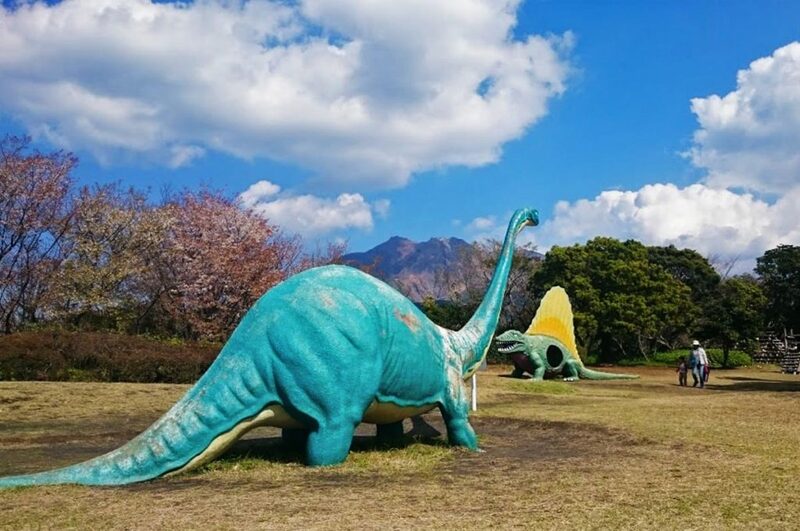 In that case, Sakurajima Dinosaur Park has you covered! Not only can you see huge, life-size structures of dinosaurs, but you can even play on some of them! Don’t forget why you came in the first place – there’s a plethora of beautiful cherry trees to enjoy in between the lessons and learning! Don’t miss out our articles about Sakurajima and Kagoshima and make your trip to these places even better! 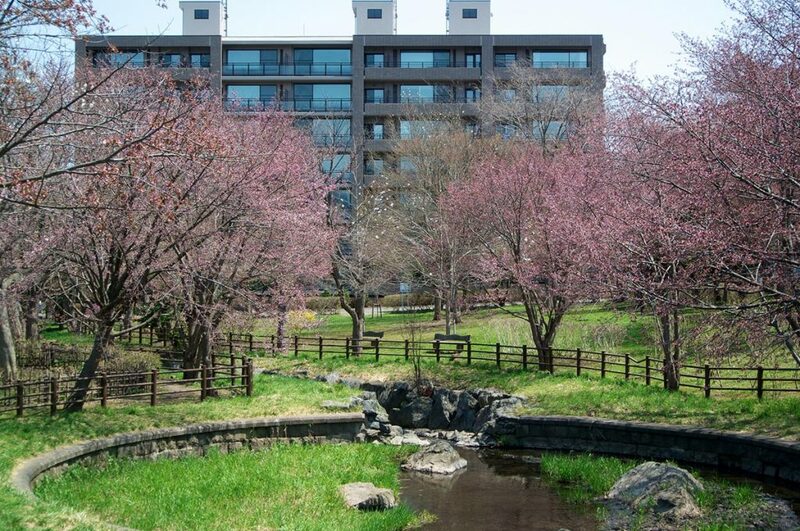 Located in Maizuru Park, there are over 1,000 cherry trees in these ruins alone! There are wide, spacious areas perfect for hosting cherry blossom festivals all over the area, and many people have said that the view of the surrounding area leaves little to be desired! Invite a few friends and have a party, why don’t you! This seaside park, like most others found in Japan, is massive! Not only that, but they’ve packed in as many cherry trees as they could; over 2,000! The area is said to be so large that it’s actually suggested for guests to rent one of the many available bikes to transverse the area. If you’re looking for a more mobile experience, try riding a bike along a long stretch of cherry trees and see how you feel! 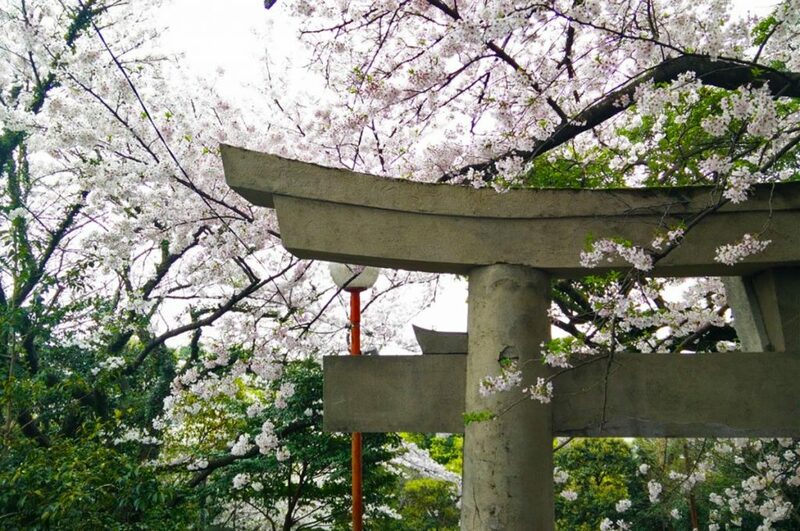 If you’re looking for a night area to enjoy cherry blossom festivals in Japan, you might want to head over to Atago Shrine! 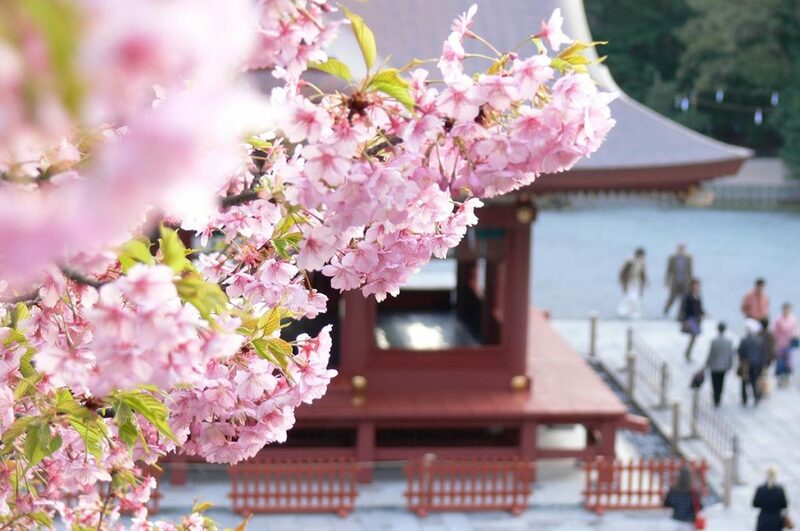 There are hundreds of cherry trees lining the steps to the shrine, and the views are to die for! Overlooking the city of Fukuoka and the nearby harbor, this location is perfect for those with a love of beautiful scenery. Are you planning to extend your visit? check our Selection of things to do in Fukuoka! 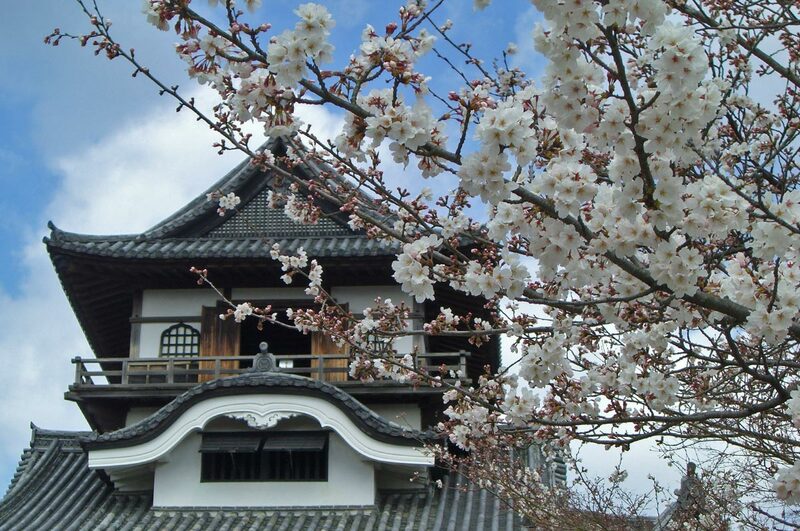 Though it’s not the original, the reconstructed castle is just as beautiful as the 450 cherry trees that surround it! 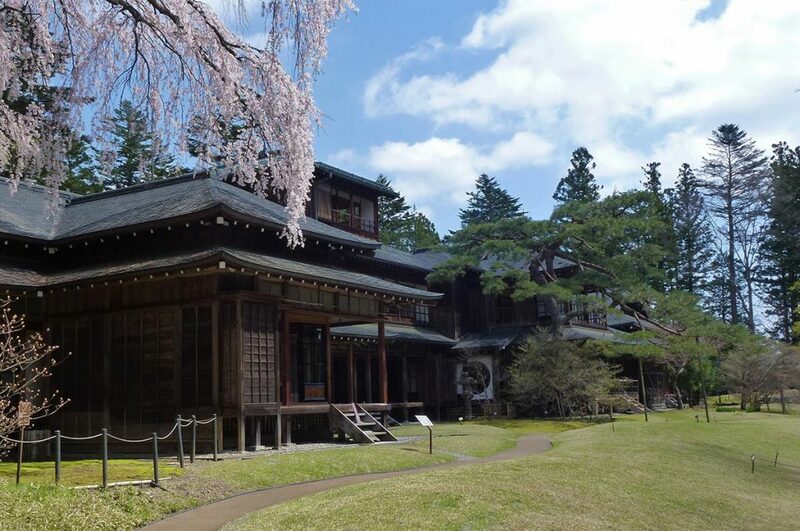 Take a stroll around the area to get a taste of true Japanese history all while you enjoy the glorious blossoms! People have been known to simply put a blanket anywhere on the ground around the castle, so feel free to join in wherever you like! Not only is this park beautiful to walk through, but it’s also a reminder of the tragedies and survival of the Japanese people. You can pay your respects in a more somber tone, if that’s your style, while still being able to enjoy the 300 cherry trees planted along the river. 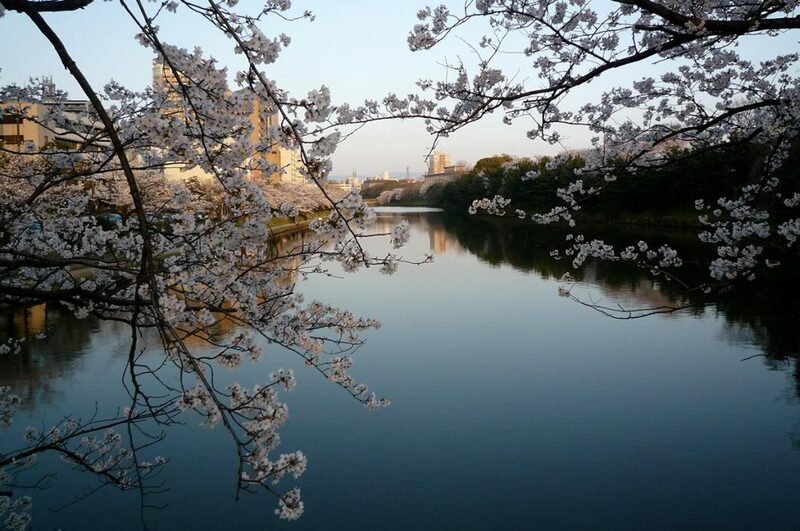 Perfect for any sunny day, you can enjoy seeing the clear reflections of cherry trees in bloom in the calm river. 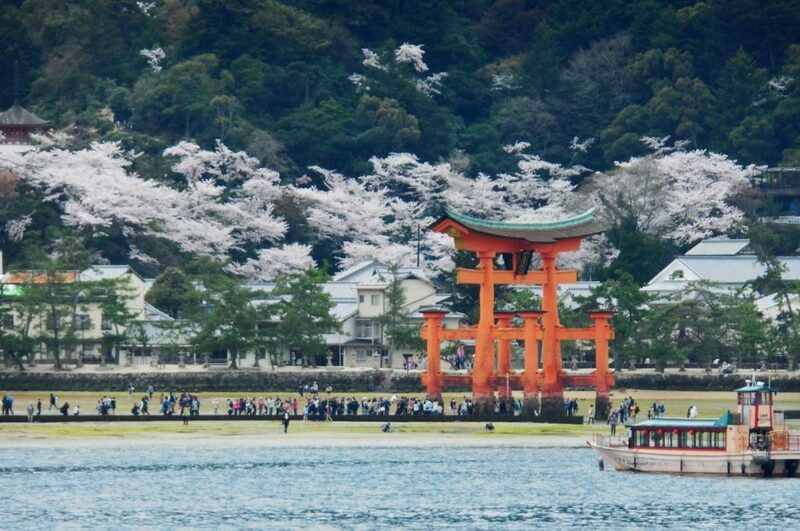 Famous for its floating tori gate, Miyajima is a small island just outside of Hiroshima. 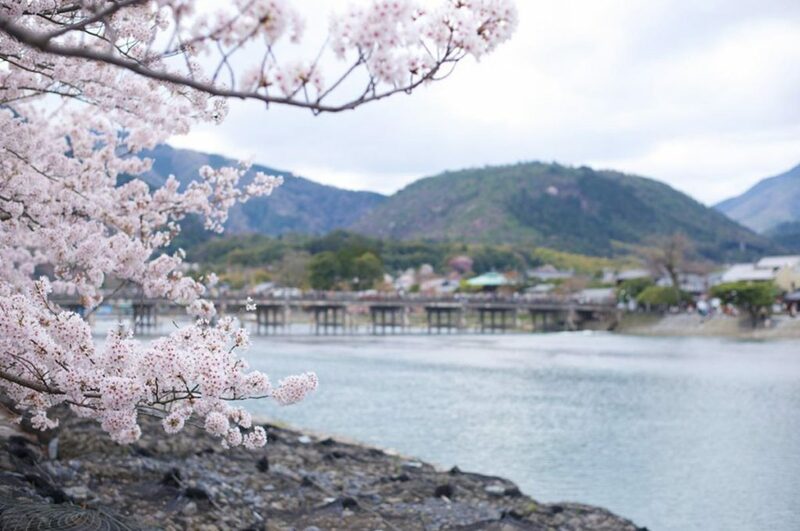 Though the area may be small, Miyajima is home to over 1300 cherry trees along the island’s walking trails! 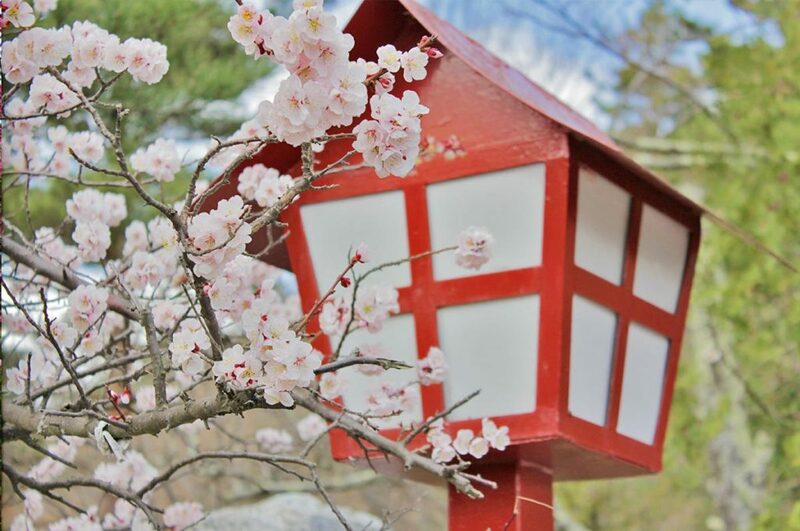 If you haven’t gotten your fill of cherry trees and want to immerse yourself in the beautiful hues of pink and white, don’t wait to cross on over to the island shrine. If you want to know more about this place, take a look at our articles about Miyajima and Hiroshima. One of the harder locations to access, this garden is most commonly traveled to by taxi! There are rarely any available methods of public transportation at any given time to reach the garden, but that’s what makes it all the more exclusive! 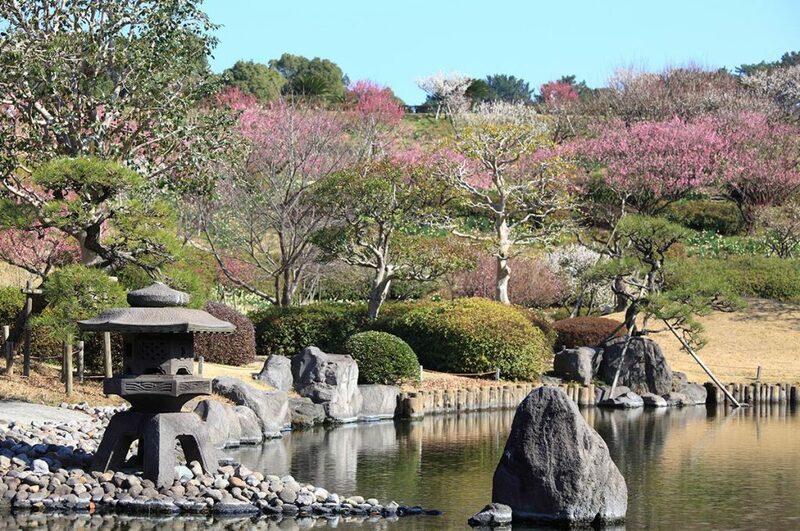 If you think you’ve missed your chance at seeing cherry blossoms in Japan, then try out this garden! With late blooming trees, you might just see some blossoms after all! Who doesn’t like popular destinations for cherry blossom festivals in Japan? This park has one large, central tree that is lit up during the night so that parties can continue well past sunset! You can meet citizens and foreigners alike at this large park. Come on over, make some new friends, and get into the festival spirit! Looking to exercise while you view blossoms? Too antsy to sit down for long periods of time? Prefer to eat and drink while on the move? If you answered yes to any of those questions then the Philosopher’s Path is perfect for you! Take a long, thoughtful journey down the path as you pass by hundreds of cherry trees and ponder life’s greatest questions. If you are planning to visit Kyoto, you can’t miss its food. Check our list of Best Food in Kyoto and pick your favorite one(s)! If you’re looking for an expansive plot of land to stake a claim for a spot to enjoy the festivities in, Osaka Castle Park is ideal. With wide, beautiful areas and over 4,000 cherry trees, you’ll find that there’s room for everyone to enjoy cherry blossom festivities! Don’t worry about nightfall – this is another area that’s known for being well lit even at night! You might be thinking, “Why would you suggest a museum – and a mint at that! – as a place to see cherry blossoms?”. The answer lies in the fact that this particular area has over 300 cherry trees and over 100 varieties of said trees to look at! If you want to see a multitude of colors and flowers all in one place, then the mint is right where you need to be! 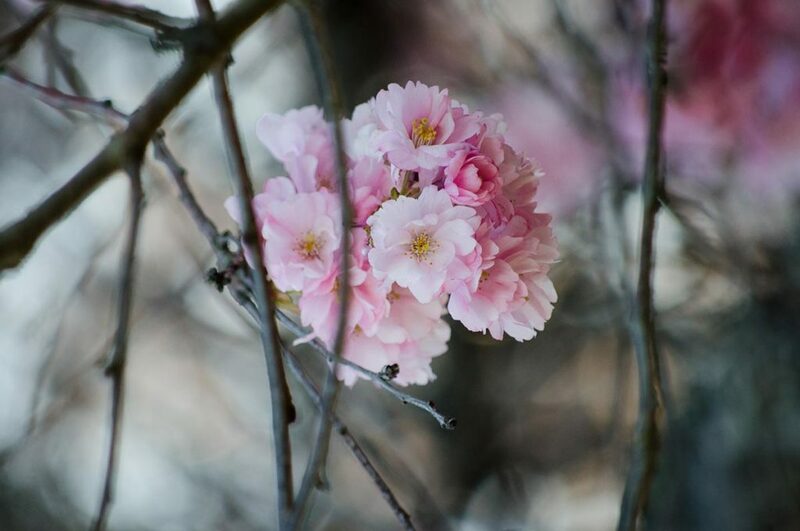 Be sure to plan ahead, as the gates to the area with the cherry trees are only open for one week of the year – right when the flowers are at their peak of beauty! Whether you wish to travel by land or by sea, this park combines the best of both world. With over 5,000 cherry trees lining the river as far as the eye can see, you can enjoy the views either sitting on one of the many spacious lawns or from the deck of a ship. 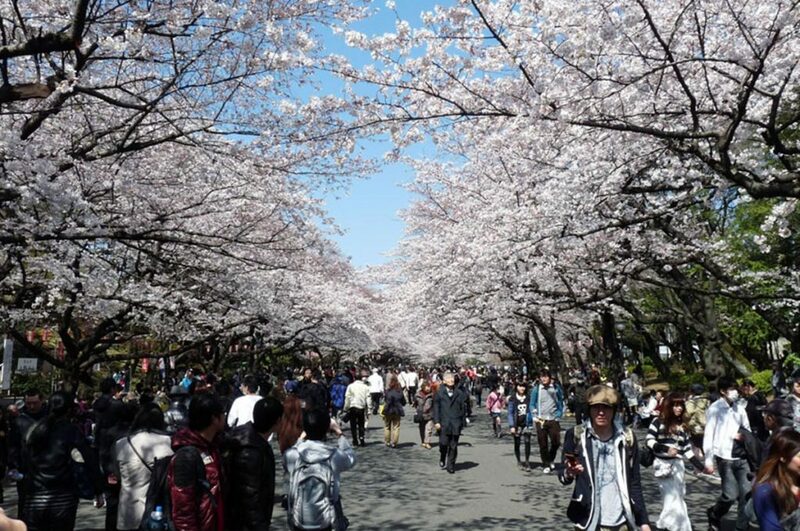 If you’d like, you can walk a few kilometers in any direction and still enjoy the sights of cherry blossoms. Though you might be thinking that castle ruins are not ideal for viewing things of beauty, the crumbling effect of the buildings actual accent the growth of the trees. Much like how the flowers of every sakura bloom before they fall, castles do not last forever. For a bit of thoughtful juxtaposition, set out a blanket and dig into a bento on the grounds of these castle ruins. Yes, there are deer here! You know what’s even more plentiful than the deer? Cherry trees! There’s over three cherry trees to every deer, meaning there’s over 1,700 cherry trees just waiting to be viewed during hanami! 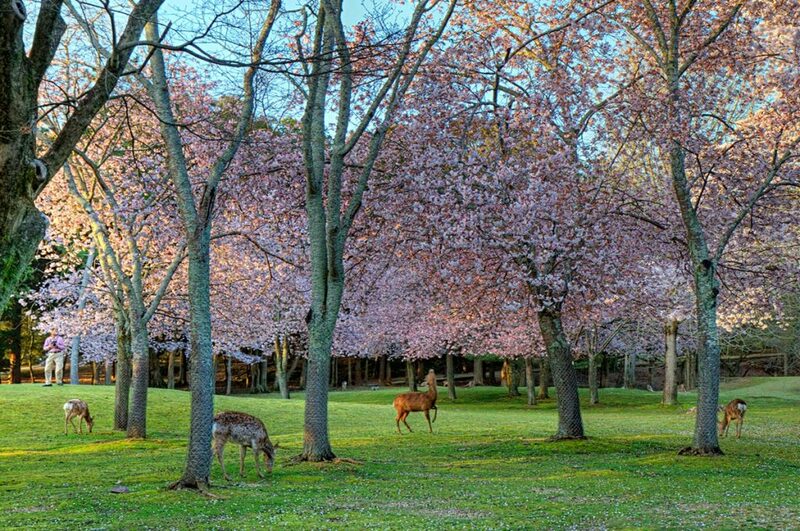 This place offers the ultimate one-two punch; see some deer and some sakura blossoms! It’s truly the best of both worlds. Sometimes called ruins and sometimes called a park, this area is perfect for viewing beautiful cherry blossoms in Japan. If you just missed the peak blooming times for other areas in Nara, you’ll be delightfully surprising by the fact that the placement of cherry trees here allows them to bloom a few days after everywhere else in the prefecture. 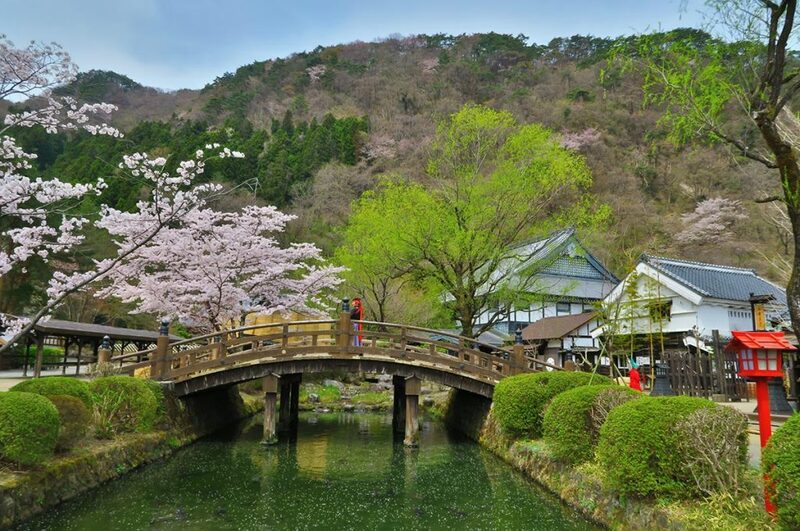 It’s okay to be late – there’s still time to join in on cherry blossom festivals in Nara! This castle is the perfect location for anyone who believes that if they’ve seen one cherry tree that they’ve seen them all. 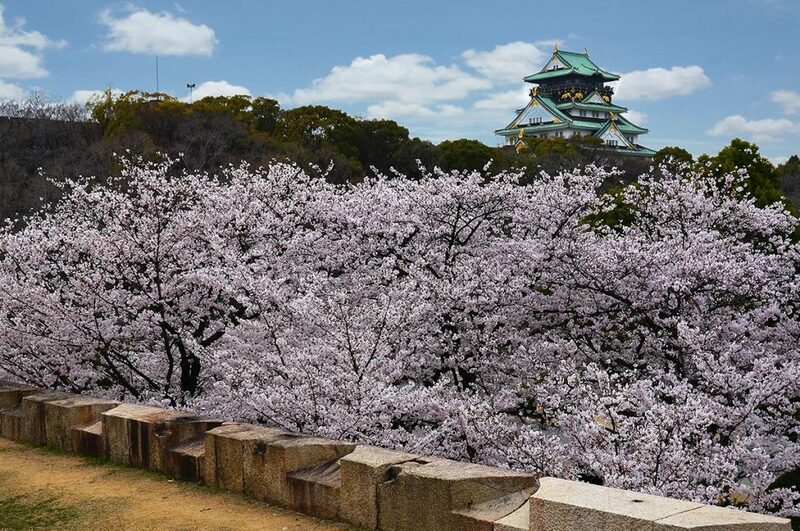 Host to some of the lesser known and lesser seen cherry tree varieties, Nagoya Castle is a one-of-a-kind to enjoy cherry blossom festivals while in Japan! Come see something new and make lasting memories of hanami! One of Nagoya’s most popular parks, Tsuruma park is perfect for those who don’t want to pack their own food and drinks! There are plenty of food and drink stands around the park, as well as areas to set up camp beneath the beautiful trees. Even though you might get to pack a little lighter, don’t forget a blanket and some sunscreen! 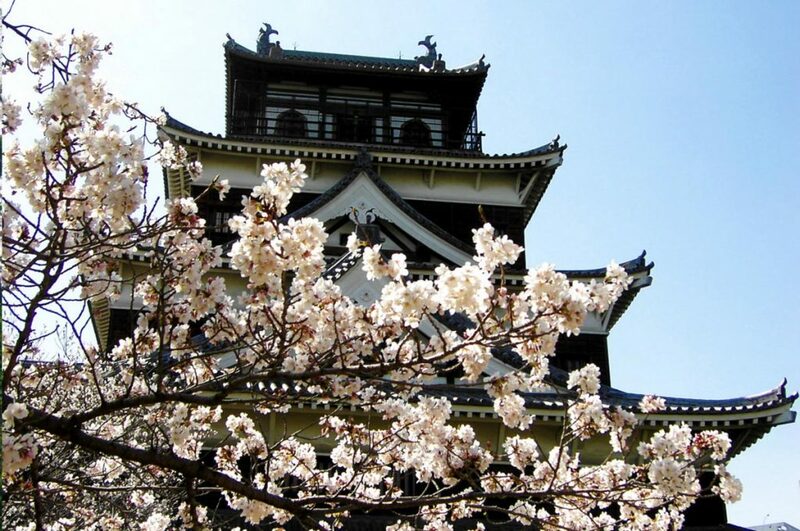 If you don’t want to dedicate a full day to just viewing cherry blossoms, then head over to Inuyama Castle for more than just hanami festivals! There’s plenty to see and do in this spacious area, and you’ll get a better sense of the true Japan scenery. There’s also over a hundred cherry trees in case you don’t want to miss the cherry blossom festivities! Nagoya has so much to offer! 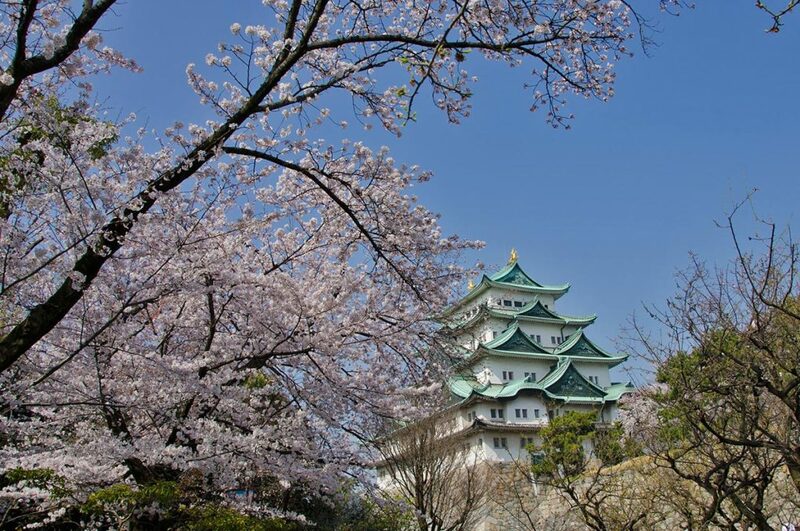 You can discover more on our article Top 10 things to do in Nagoya. Not only are there lovely cherry blossoms to appreciate here, but the park also houses a wide selection of beautiful flowers almost year round! 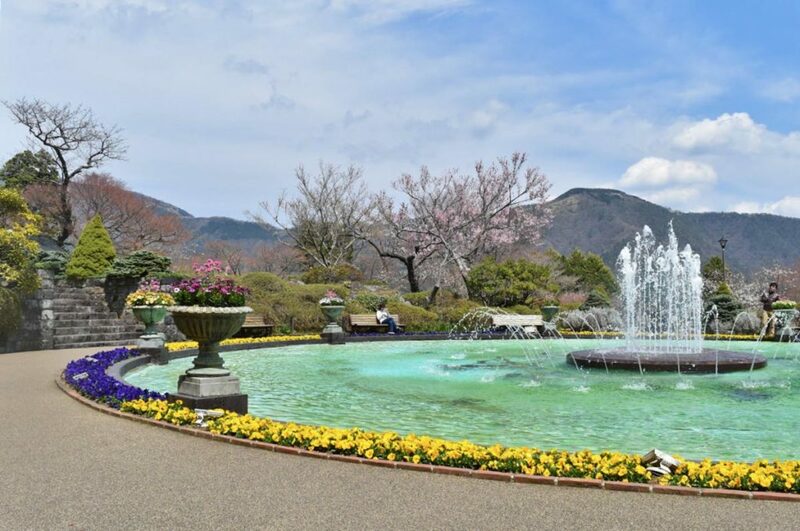 With a beautiful fountain as the centerpiece, it might be difficult to remember that you came for the sakura! Crazy enough, if you want to have an enjoyable stay in a great hotel with amazing sights of Japanese cherry blossoms, then book a stay at Kijitei Hoeiso! 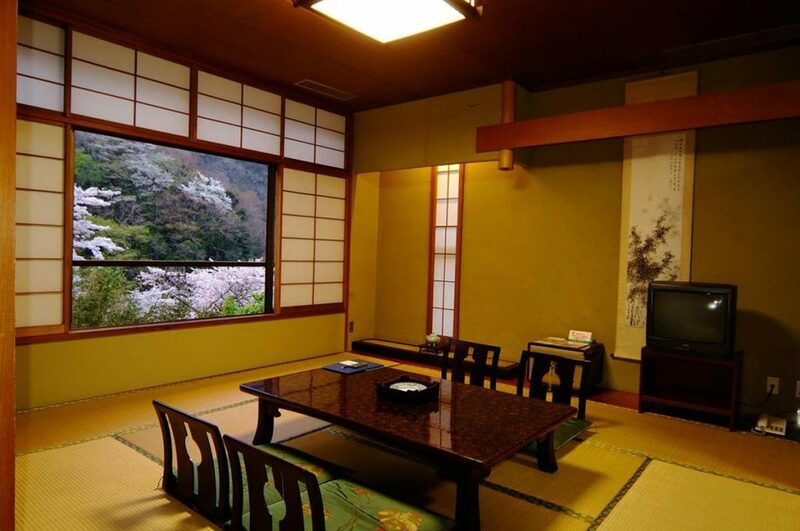 You can view gorgeous sakura, as well as amazing mountain sceneries, right from the comforts of your own personal room! After a long day of travel, you can rest easy knowing that you have one of the best views in town – at one of the best places to stay! 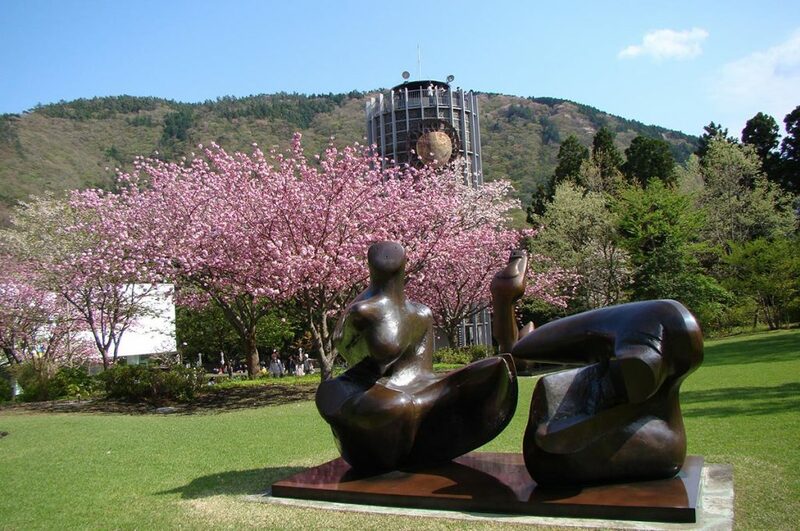 Not only will you get to experience a thought-provoking trip through a museum while enjoying fresh air, but you’ll also get the chance to see wondrous cherry blossoms while they’re in season! If you time your trip just right, you’ll get two shows for the price of one admission ticket! Make sure to time your journey just right – you won’t want to miss this two-for-one special! Hakone, for sure, is one of those unmissable places to go when in Japan. Make the most of your time in there by checking our article about the Top 10 things to do in Hakone. If you’re at all interested in large statues of famous figureheads, then you need to head over to Kamakura! 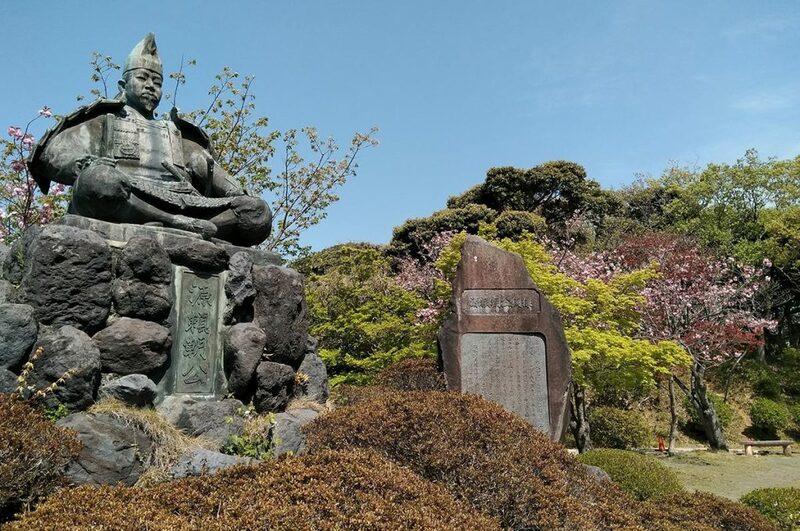 This park sports a statue of Minamoto Yoritomo, and was actually an area that saw many important events of the Kamakura Period. Perfect for picnics, there are about a dozen or so cherry trees that will brighten anyone’s day. This shrine has seen a few changes over the years, but remains an amazing place to view cherry blossoms during their blooming season. 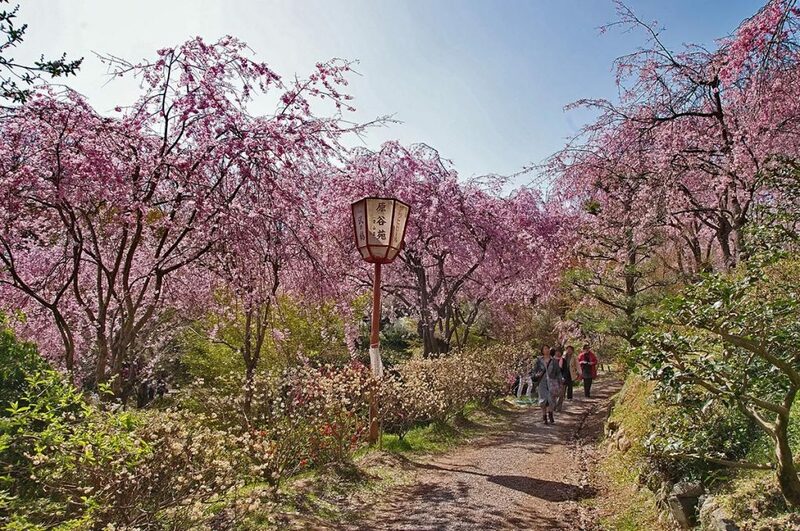 The area that approaches the shrine called Dankazura is lined with over 100 cherry trees, making anyone’s approach to the red gate seem special and memorable. 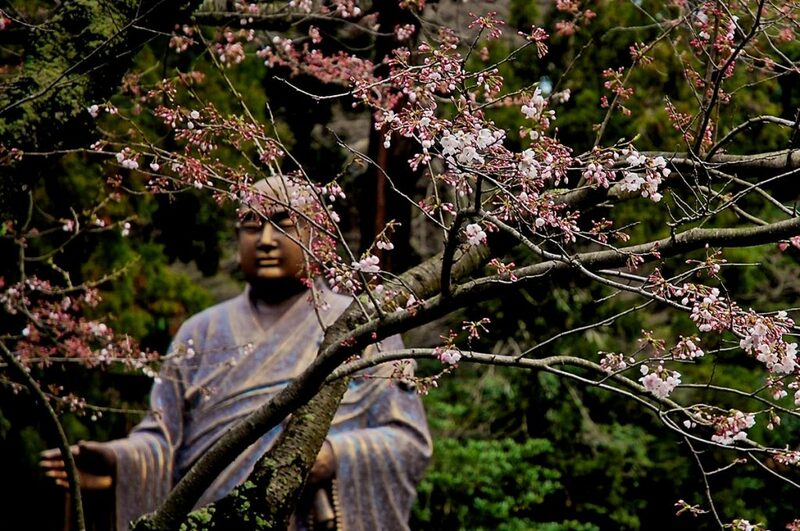 As cherry blossoms can be interpreted to symbolize peace and tranquility, it’s only fitting that there should be an area with a Buddha statue and sakura trees! Don’t be saddened if you notice the small number of cherry trees here when compared to other locations – there’s one tree you can get in the same shot as the great Buddha himself! 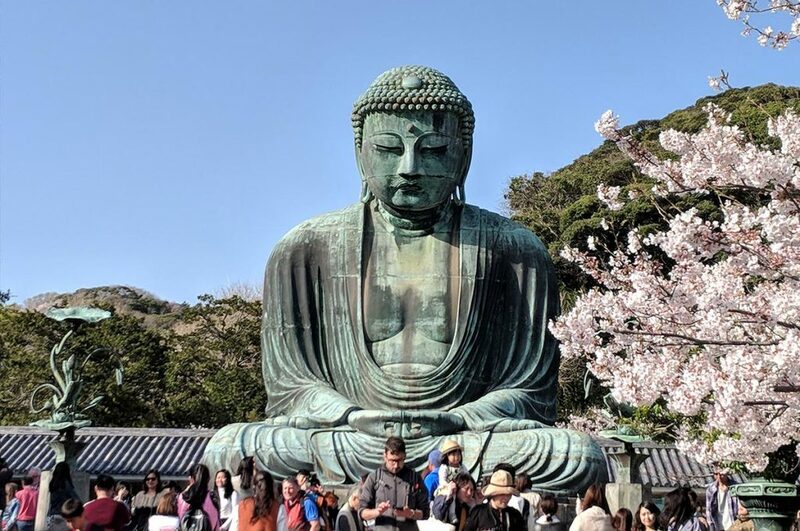 Check out our Selection of Things to do in Kamakura and add more amazing places to your visit! If you’ve ever researched areas in Japan that are popular for tourists, expats, and natives, you’ll likely have stumbled across Ueno Park. 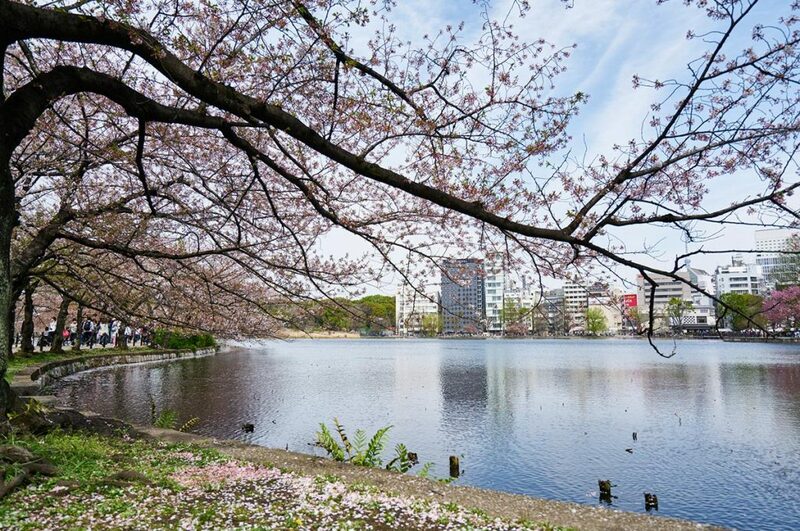 With blossoms that are usually a bit earlier than others found in Tokyo, Ueno is perfect for early birds who want to get a preview of the rest of the season! Though you may have to fight your way through the crowds, the sights will be worth the hassle! 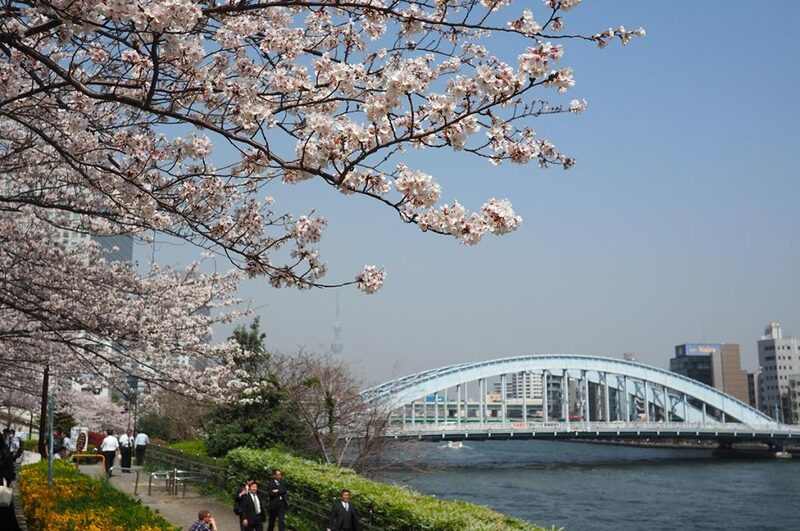 Ever wanted to see the Tokyo Sky Tree and Japanese cherry blossoms in the same view? 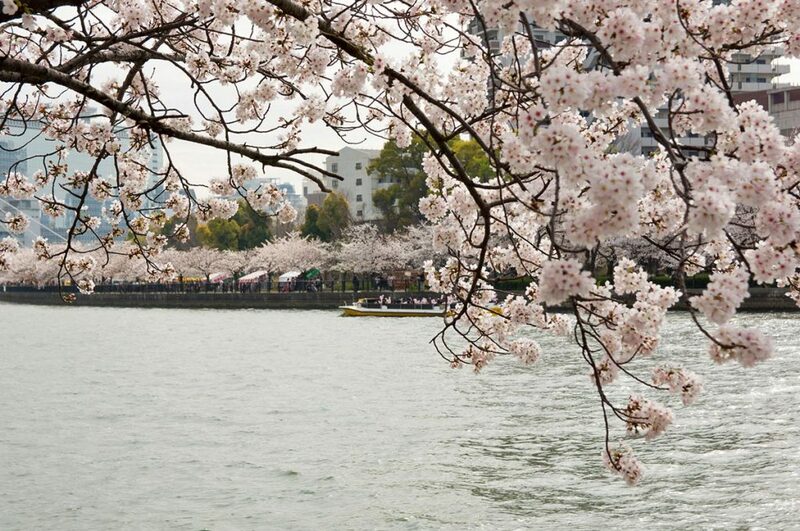 Then head over to Sumida Park along the Sumida River! If looking at beautiful blossoms by land isn’t your style, then hop onto a boat and enjoy the view from the water! There’s plenty of ways to enhance your experience, and if you forgot to pack a lunch, there’s sure to be a stall or two ready to serve you authentic Japanese food! 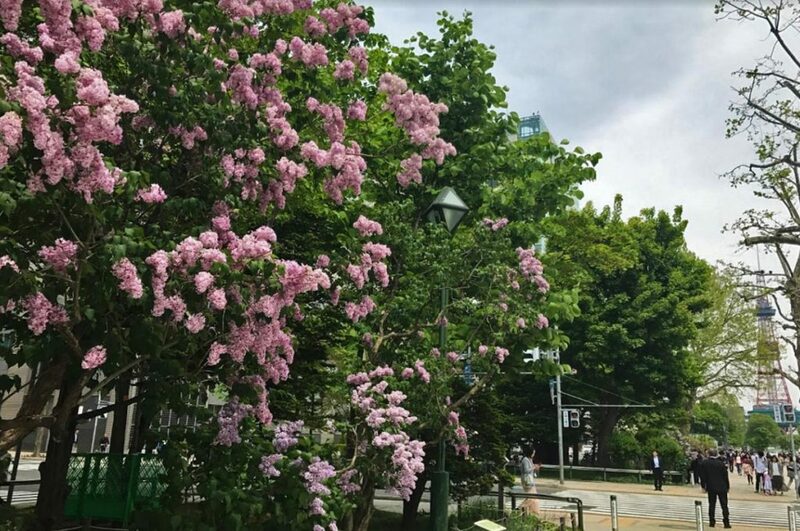 Whether you’re early or late to the Tokyo average bloom season, this park sports many different varieties of cherry blossoms that bloom at different times! So as long as you make it here at some point during cherry blossom season, you’re sure to see at least a couple of trees in bloom! 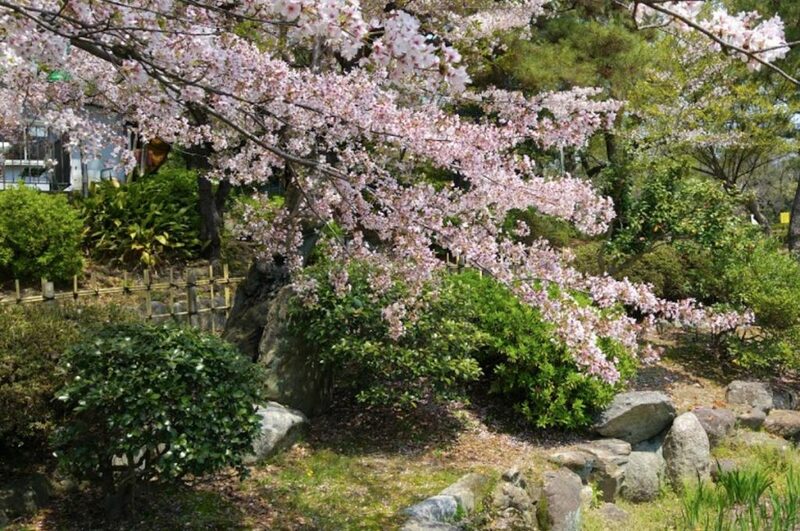 If you’re into beautiful gardens that are accented by cherry blossoms, then this memorial park is perfect for you. With some trees that are over 400 years old, there are deep roots under this historic site. Even if you miss the best time to see cherry blossoms, there are always glorious flowers and plants to observe year round! Edo Wonderland is an ideal location if you’re looking for a Japanese-style theme park that also has gorgeous scenic areas. For those who are seeking both thrills and memorable sights, you can get your fill of fun and cherry blossoms all in the same place! Though it’s one of the lesser known areas, this hidden gem of a shrine is home to a lovely array of cherry blossoms. 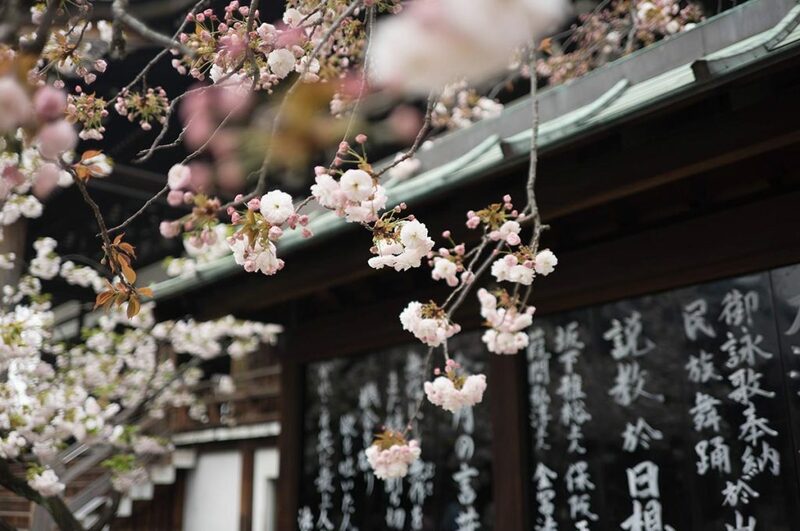 As it is a buddhist temple, the shrine is more humble than others in the area; that just gives the sakura more of a spotlight when they’re in full bloom! Located directly next to the Hokkaido Shrine, this park is home to over a dozen beautiful cherry trees. 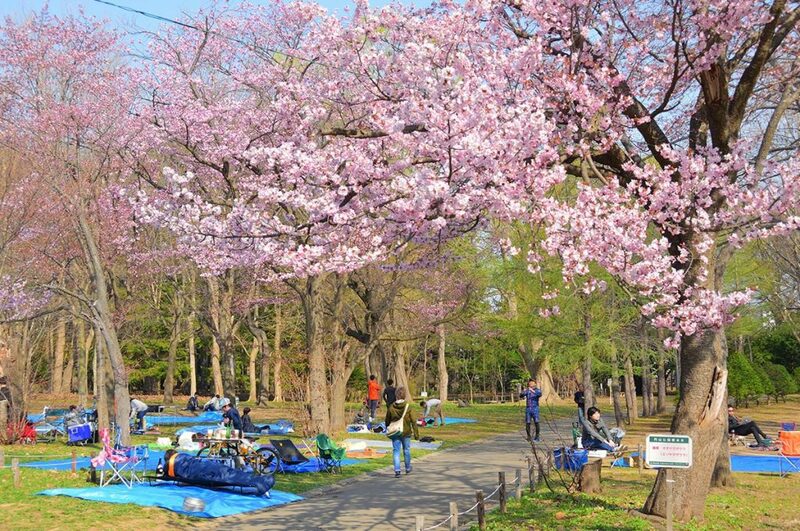 Due to its popularity, the park is host to many hanami parties during the cherry blossom season. With such perfect areas to lay out a blanket and enjoy a picnic, it’s no wonder people choose it over most other places! Odori Park is, hands down, the most famous park in all of Sapporo. Though it doesn’t offer quite as many cherry trees as other areas, the ones that can be found in the park are quite beautiful during blooming season. Picture perfect sceneries mixed with a cherry blossom here and there create a desirable landscape for photo opportunities. 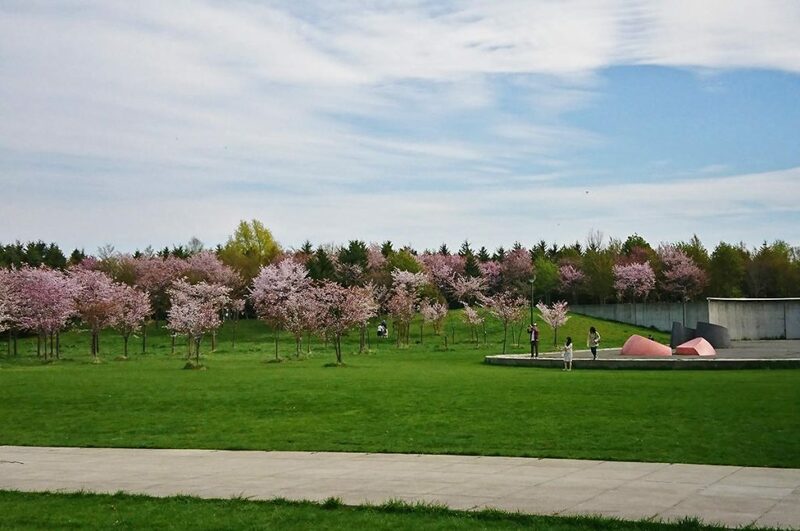 The cherry trees in Moerenuma Park run a bit late during blooming season, so don’t get bent out of shape if you think you lost your chance at experiencing hanami up North! 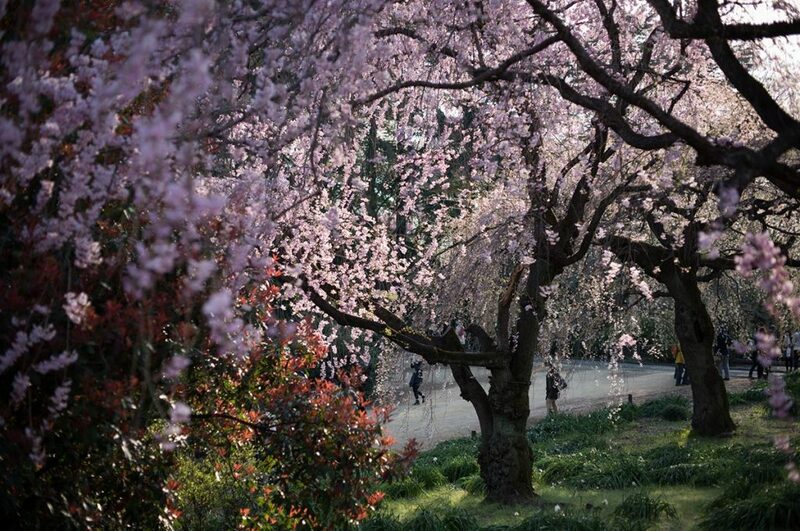 With a dense grove of sakura clustered together in one section of the park, you won’t be able to take a step in the weeks after hanami without your foot touching a flower petal or two. Do you want to explore more? In our article, Things to do in Sapporo, you can discover all the amazing places you should add to your list. No matter where you go in Japan, you’re sure to find a cherry tree or two that you can watch and enjoy during cherry blossom season in Japan. Even if you can’t make it during the small window of opportunity, there are many other wonderful sites to see in the land of the rising sun! With that said, we still recommend trying to plan your trip during one of the few weeks out of the year when nearly everyone in the country will be happily celebrating – you won’t regret it! Do you like our articles and don’t want to miss any of them? Follow us on Facebook, Instagram, and Pinterest. Also, if you want to share your Japan with us and get to know more Japan enthusiasts, join our Facebook group. Matane and enjoy the sakura time!